Days of Our Lives (DOOL) spoilers tease that John (Drake Hogestyn), Roman (Josh Taylor) and Kayla (Mary Beth Evans) will deceive those closest to them. Of course, it’ll be for a good cause! John just wasn’t ready to give up on Marlena (Deidre Hall). He wanted to give her an opportunity to recover, but that advance directive was in his way. That’s why John hatched a plot to fool his own family. During the week of September 17-24, Days viewers can expect to find out quite a story. Since the plug’s already been pulled, DOOL will have to work backward here. They can show what went down in the hours leading up to that moment. 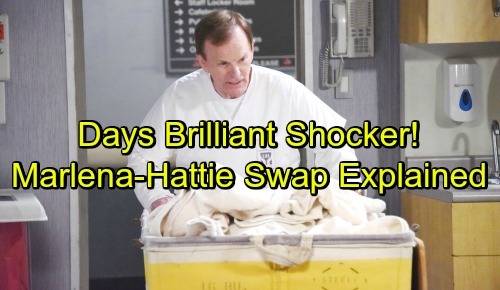 Days of Our Lives spoilers reveal that Hattie (Deidre Hall) made a prison getaway with a little help from the schemers. She happily agreed to a soapy swap. Hattie isn’t a big fan of life behind bars, so living in Marlena’s (Deidre Hall) world for a while must’ve sounded nice. John will just be happy to buy “Doc” more time. Days of Our Lives spoilers say Marlena will be hidden on an abandoned floor of the hospital. There are some remodeling plans up there, so Kayla was able to create a clean and comfortable suite for her friend. Naturally, Kayla is taking another huge risk here. She recently gave Abigail’s (Marci Miller) medical records to Stefan (Tyler Christopher), but going against Marlena’s advance directive is even worse. This involves duping plenty of people. Kayla, Roman and John will also be harboring a fugitive thanks to Hattie’s involvement. It’s clear that they’re putting a lot on the line to keep Marlena alive. Nevertheless, they’ll all feel like it’ll be worth it in the end. While they wait on Marlena to wake up, they’ll have to suffer through her doppelganger’s drama. Things will start off just fine when Hattie awakens as Marlena and fills her loved ones with delight. Unfortunately, it won’t take long for the plan to head downhill. Hattie will fume at Sami (Alison Sweeney) over the shooting and berate Belle (Martha Madison) for nearly killing her, too. Once John and Hattie are alone, he’ll urge her to cool it. Days spoilers say Hattie will ultimately apologize, but she’ll cause another round of trouble later. After flirting with Roman and getting rejected, Hattie will want to marry John ASAP. He’ll put up a fight since he has no interest in marrying anyone except Marlena, but Hattie will insist. Another wedding will be in the works before you know it. Several unsuspecting Salemites will get caught in this chaos, so stay tuned. We’ll give you updates as other Days news comes in. Stick with DOOL and don’t forget to check CDL often for the latest Days of Our Lives spoilers, updates and news.